We are honored to be recognized as an industry leader by the nation's premier business awards program. On April 24, SynCardia completed the minimum enrollment required by its FDA-approved Investigational Device Exemption (IDE) clinical study of the Freedom portable driver, the world’s first wearable power supply for the Total Artificial Heart. 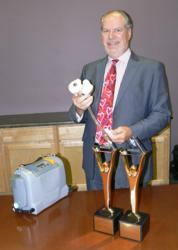 Weighing 13.5 pounds, the Freedom portable driver is designed to allow stable Total Artificial Heart patients who meet discharge criteria to leave the hospital and resume their lives at home while they wait for a matching donor heart. The Freedom driver, which is also CE approved for use in Europe, has supported more than 85 patients worldwide, accounting for more than 30 patient years of support. Nicknamed the Stevies for the Greek word for “crowned,” the trophies were presented to honorees during a gala banquet on Monday, June 18 at the Marriott Marquis Hotel in New York. More than 500 nominees and their guests attended. The presentations were broadcast live by the Business TalkRadio Network. More than 3,000 nominations from organizations of all sizes and in virtually every industry were submitted this year for consideration.